Kawasaki swingarm protectors by Lust Racing. Lust Racing swingarm protectors in stunning design and finish for Kawasaki motorcycles, metric 6x1.00 mm bolt fitting directly to the swing-arm. "Bolt on" installation in minutes with basic hand tools. These paddock stand bobbins / swingarm protectors have a stunning design and finish you can only find on Lust Racing products. Made out of high quality extruded material intended for crash protection, not just cheap casted acetal plastic as other protectors on the market. 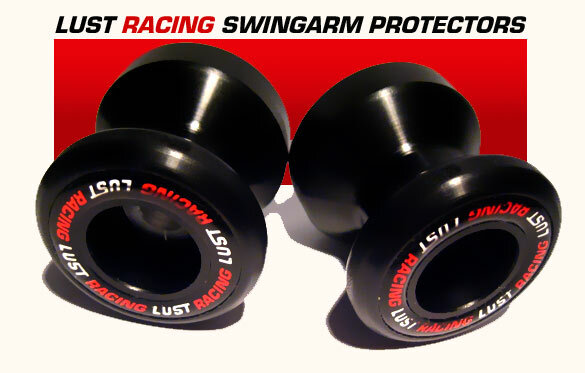 Lust Racing swing arm protectors have superior wear and impact resistance. The swingarm core is factory fitted with compression sleeves in lightweight T6 aluminum. Stunning design with 3D embossed logo recessed in the protector. If you are looking for the finest swingarm protector/paddock stand bobbin on the market, look no further - this is it! These swing-arm protectors fit the following models: - Kawasaki Z750 All, Z1000 (->2005 not for STD exhaust), ZX6R/636 (2000-20005),ZX6R 2006 ->, ZX9R all, ZX10R,ER-6N. These are high quality swingarm frame sliders made by UK based Lust Racing Ltd. The swingarm protectors are sold as a ready-to-install, complete kit containing 2 Lust Racing swingarm protectors with factory core sleeves in T6 aluminum, stainless steel Allen key bolts, and installation instruction. See also our model specific heavy duty crash protectors and frame sliders for Honda, Kawasaki, Suzuki, Triumph and Yamaha motorcycles! (Note that some early Kawasaki models came with M8 and some with M12 metric fitting. Please check the tread size on your bike before ordering if unsure. Also some Yamaha models like Fazer,YZF750,TRX850 have M10 bolt fitting - select our Swingarm protectors with M10 bolt fitting). Contact us if you are unsure about the correct size for your bike! Fitting metric M10 10x1.25mm or M10x1.50 depending on your bike. NOTE:These swingarm protectors fit most Kawasaki models and are supplied with two bolt thread sizes M10x1.25 and M10x1.5 as both thread sizes has been used by Kawasaki. Select the correct thread bolt when installing on your Kawasaki. NOTE: these Swingarm protectors CAN NOT be installed on Kawasaki ZX10 2008-2010 models with standard exhaust can, the swingarm protector can touch the exhaust can during the suspension movement. Fine on other Kawasaki models. With some (not all) aftermarket exhaust cans you can fit these swingarm protectors to your Kawasaki ZX10 2008-2010 but you need to check the clearance between protector and exhaust for the full suspension movement. Lust Racing Ltd. designs and manufactures motorcycle accessories, our customers range from racing teams, motorcycle dealers and workshops to private customers worldwide. Every customer at Lust Racing is a highly valued one. We want all our customers including YOU to be 100% satisfied with the products and the service we provide. We believe in the old saying "Only happy customers return!". 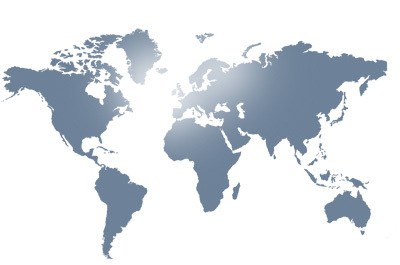 We consistently develop new our products and refine our services. We are grateful for your feedback and new product or improvement suggestions. Our aim is to provide high quality motorcycle accessories, parts and racing products to a competitive price. Should you against all odds not be satisfied with the products or the service we provide, just contact us. We are always willing to resolve any issue.